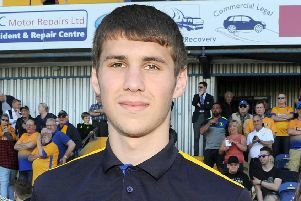 Mansfield Town v Lincoln City. 'Conrad Logan. Mansfield Town boss David Flitcroft is keeping his cards close to his chest over which keeper to pick for tomorrow’s visit of Crewe Alexandra. Having dropped Forest loanee Jordan Smith, Flitcroft saw Conrad Logan give away a crucial penalty in Monday’s 1-1 home draw with Lincoln City as well as fail to hold a couple of crosses. 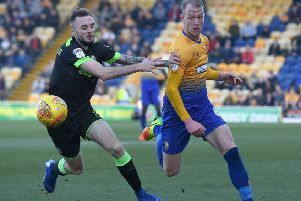 Some fans criticised Logan on social media and called for smith;s return, but Flitcroft said he would speak to both keepers before he making his decision public. “After a game there are a lot of emotions flying round. I always feel it’s the wrong time to open those forums up,” he said. “But I will always speak to players before I do anything in the press. “I have a very honest relationship with them and it’s a very personal and private one. “The players are in today and I will let them know what we got right and what we got wrong.